WSU’s Master of Education (EdM) in Special Education degree, offered fully online, is designed for educational professionals wishing to extend their knowledge and skills in education, expand their understanding of special education practices and strategies, and pursue leadership roles in schools, organizations or agencies. The program also gives certified teachers the preparation for the state endorsement they need to teach pre-kindergarten through 12th grade special education in Washington State. In Washington State, and nationwide, there is a shortage of qualified special education teachers, increasing the demand for skilled special education professionals. 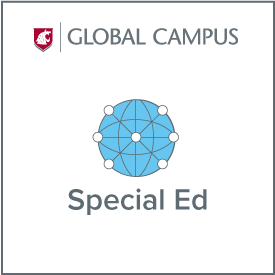 WSU’s EdM in special education is designed to address the Washington State Special Education Core Competencies for special education teachers and aims to prepare students for roles in teaching and leadership in this field. All courses are online, allowing maximum flexibility for working professionals. Upon graduation, you will be able to demonstrate an advanced depth and breadth of understanding about the field of special education and disabilities. You will be able to use critical thinking to evaluate, understand, and communicate special education ideas and research, applying those ideas to problems in both the teaching and administrative spheres. You will learn practical techniques and best practices for teaching students at various developmental levels and will be highly qualified to pursue rewarding careers in special education. The program prepares students to teach all students with disabilities (including those with autism spectrum disorders) from early childhood through high school. Program courses provide students with evidence-based teaching strategies that address a wide range of topics, including reading and writing disabilities, behavior management, social skills, students with intensive needs, and academic improvement. Faculty instructors all have experience teaching students with disabilities in K-12 settings and have wide and diverse areas of special education expertise including autism spectrum disorders, intellectual disabilities, emotional/behavioral disorders, early childhood, and transition. Interested students can apply at the Graduate School’s admissions page. The College of Education graduate programs page offers a general overview of the application steps. If you have questions about the degree, please contact Kelly McGovern at mcgoverk@wsu.edu or 509-335-9195.